Ridgeway now supply the state of the art Limpet system for access to wind turbines, on oil and gas offshore installations, and for use in staging events. 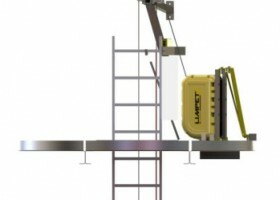 The Limpet system weighs the climber and equipment and, unlike other systems on the market, automatically applies 90% assistance. A fast, integrated rescue and evacuation function sets the Limpet apart from competitor products. The 90% climb assist gets technicians to the nacelle twice as fast as unassisted climbing and 25% faster than next best system. Higher return due to less maintenance time.